We all think that we can buy some beaten up barn find for cheap and restore it to perfection on a shoe string budget...but the truth is far away. Most of us don't have the time, garage space, tools, fortitude, wherewithal, or capability to do a good job and we'll all spend 3X as much money as we'll ever recuperate in a future sale, so why not buy a completed machine and just drive. Find this 1978 Volkswagen Scirocco Turbo here on eBay bidding for $11,000 in West Palm Beach, FL. 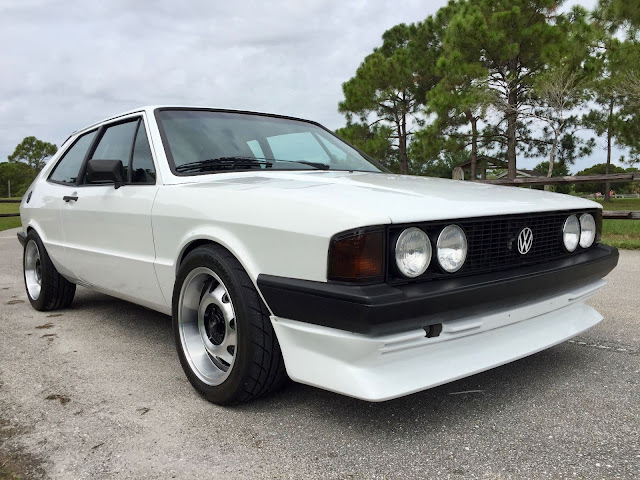 This is an interesting build -- it has an 80s GTI (JH) 8-valve engine that has been built in a very old school style. The car is boosted with a Callaway stage 2 turbo system that uses a Rotomaster T3 turbo to produce an undisclosed amount of horsepower with 15 psi of boost. Featured in VW & Porsche Magazine in April 1984 article “Hurricane Force Scirocco.” Also known as being the test bed for New Dimensions Turbo Systems & “Turbo-Tim” Hildabrand, the previous owner of this Scirocco and original owner/president of New Dimensions in San Jose CA. I purchased this Scirocco from Tim back in October 2014 knowing it was a resurrection project. The car was not running and had not run for quite some time and needed much TLC to get it back to its former glory. After having the car shipped from Northern California to South Florida, we pushed it off the truck and into the garage to begin the resurrection. Being a VW/Audi Parts Manager for the past 16 years, I began sourcing replacement parts and got the process underway. This car is full of period correct and very rare performance parts and I did not compromise any of the provenance when bringing this car back to life. The Stage 2 Callaway Turbo System is fully intact & functional along with the Callaway Micro-fueler and updated Tial external wastegate. Throughout my ownership, I have rebuilt this wonderful car and have had a wonderful time reliving my past, driving the car and sharing its history with friends, family and all the enthusiasts at shows and Cars & Coffee events. I am always amazed at the attention this Scirocco attracts and the questions the younger generation ask when admiring the car. This car is true old school water-cooled Volkswagen nirvana, I will regret parting with it however it is time to move onto another chapter in my life, it will be missed. 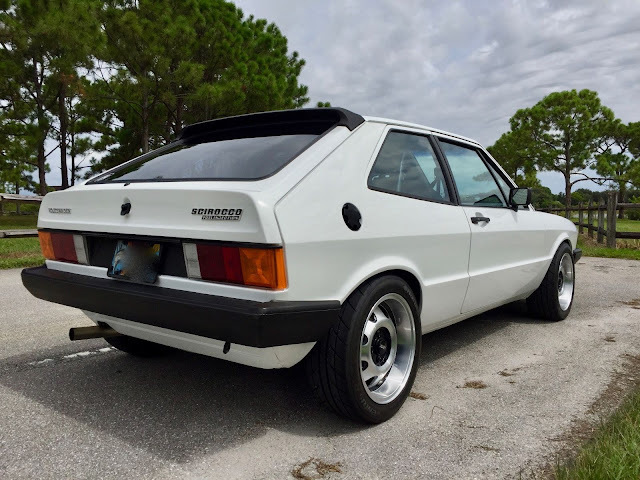 Rust free 1978 MK1 Champaign 2 Edition Scirocco, original California car, now in South Florida, No rust, rock solid floors, undercarriage and wheel wells, repainted by previous owner in late 1990’s and then garage stored (I don’t have the exact dates). The body has a few dings & scratches from while it was stored away in hibernation. White paint is deep & glossy, no signs of oxidation or cracking. Features Ultra-rare Zender front spoiler, Zender upper rear hatch spoiler and OEM European spec bumpers. Radio antenna delete and body molding & graphics delete. Chassis & suspension features new urethane suspension bushings, Auto-tech hollow rear 28mm anti-sway bay, Eurosport front lower tie bar, and Suspension Techniques (ST) upper strut tie bar. New H&R MK1 Coil-over suspension & bushings installed. New Steering rack and steering column bearings. Scirocco 16V 4-wheel disc brake conversion. Stainless steel brake lines, New StopTech gas slotted brake rotors front & rear with Hawk HP brake pads. (NEW EBC Yellow race pads in box included in sale). 15x7 ATS Cup Wheels. Super rare & discontinued, period correct, NEW from UK. NEW Hankook Ventus R-S3 tires, size 195/50R15. Callaway Turbo System, Stage 2 with Callaway Micro-fueler & custom intercooler. T3 Rotomaster Turbocharger rebuilt August 2016 by Blaylock Turbos. New Callaway Turbo exhaust manifold, New TiAl 38mm wastegate, New Forge blow off valve, New custom silicone turbo hoses and hardware. Turbo heat blanket, heat wrapped & high temp painted turbo downpipe, new Techtonics 2.25” stainless steel exhaust with Borla muffler. Forge & Turbo XS mechanical boost controller. 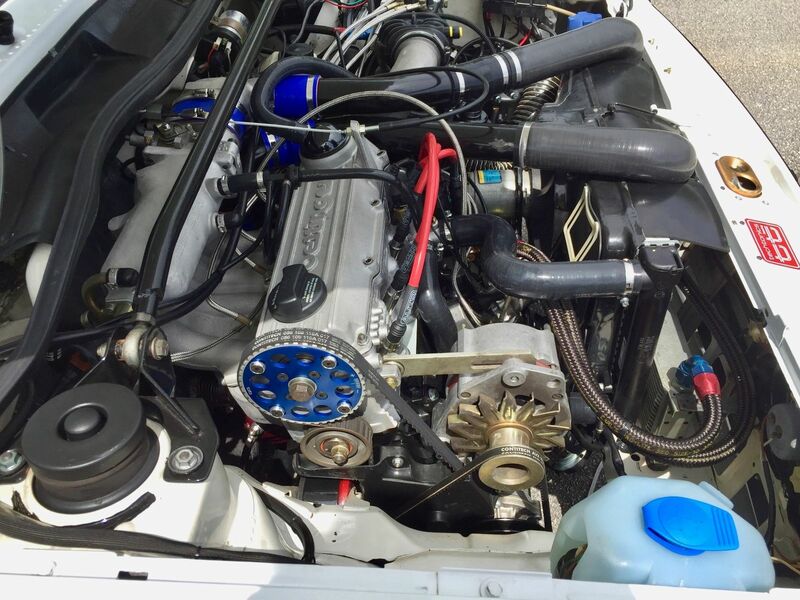 Rare European oil cooler thermostat flange, remote oil cooler with custom lightweight Earl’s hoses & hose ends, Techtonics Racing baffled oil pan w/windage tray, Silicone coolant & vacuum hoses, Ultra-rare Oettenger Valve cover, ABA rubber valve cover gasket retrofit. Dual speed radiator fan, 70C degree thermostat and matching dual temp fan switch. New ignition components, knock sensor ignition retrofit, new fuel pump, fuel accumulator, baffled fuel tank, new fuel lines installed. 16V 2Y 5 speed transmission with Quaife Limited Slip Differential, Red Line MT90 Synthetic gear oil, Eurosport short throw shifter, Delrin shifter bushings. New 16V Clutch Disc & Pressure Plate. Stereo delete in lieu of VDO gauge package. VDO Gauges, Turbo Boost, Volt, Oil Temperature, Oil Pressure & Exhaust Temperature (Pyrometer). 180mph speedometer, recently recalibrated by Lauderdale Speedometer. 90-amp alternator, new high torque MK3 starter, trunk mounted Optima Battery with custom billet aluminum mounting tray. Hella E-Code H4 & H1 headlamps, custom relay bank for high wattage bulbs (100/80W H4 & 55W H1). LED interior/dash lighting. 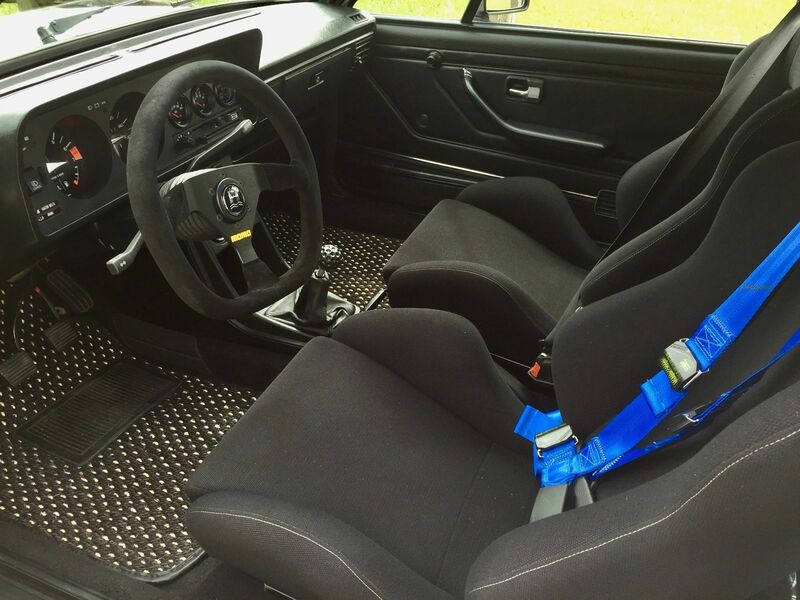 New Old Stock (NOS) Recaro front racing seats, drivers side 4 Point Schroth seat belt, rear seat delete. New Momo MOD 88 flat bottom suede steering wheel, Autopower Race Roll Bar, Vintage Electric Life Power windows. All interior components are in excellent condition and super clean, no cracks in dash, original clean carpet, new custom black and white COCO Mats. DynamatExtreme sound deadening applied to all flooring throughout car. Rear seat from a Scirocco S & rear hat shelf (w/speaker holes) and a host of spare parts included in the sale. Serious inquires only PLEASE! You are welcome to inspect the car at any agreed upon time providing you are a serious buyer. $1000.00 Deposit due upon agreement of purchase, this can be in the form of Cash, Cashier’s check, Wire Transfer or PayPal. Payment in full will be required within 7 days in Cash, Cashier’s Check or by Wire Transfer. Shipping & vehicle pick-up is solely the responsibility of the buyer. Local pick up is fine or I will assist in collaborating with your choice of vehicle carriers. Please note, Vehicle MUST be paid in full and all funds cleared prior to releasing the vehicle to the Buyer and or Shipper. Talk about a clean build. Should be a hoot to drive. My first car as a '77 model, but was nowhere near as cool as this one. I have no idea what the HP figures would be, but I have feeling this thing *MOVES*. A turbocharged built 1.8 must be capable of making >3x the horsepower a stock 1978 1.6 made (I had one--maybe is was 75bhp?). At 2000 lbs or less dry weight, this thing is decidedly a screamer.